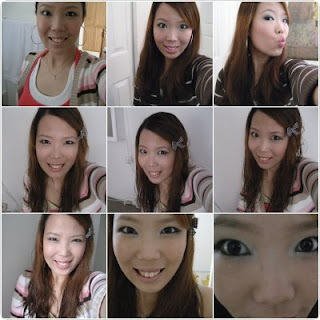 ♥Lindsee's everything♥: OMG, I am aging. I've been so scared looking in the mirror at myself lately. I didn't realize how wrinkle forms around the nose and mouth area. Well, technically, I know how wrinkles form but I didn't want to believe this would happen to me this early. At the first place, I just tried to smooth wrinkles down with products. However, it hardly went away only using anti-wrinkle creams. So I decided to find out the fundamental issues about my wrinkles. First, I force a smile. It makes wrinkes deeper and deeper around the nose and mouth area. After age 25, if you are a woman, you should take a good care of yourself, especially your skin! Everyone ever heard about the saying, 'A most beautiful age of woman is 25', which means,at this age, woman's body is mature enough to fulfill biological functions. Their hormone system settled perfectly so that the harmony of the interactions with other organs makes their appearance nicer. However, you should keep in mind it also means your beauty is just starting to decline when you get reached to the peak. Going back to the point that I was going to make, if you are at age 25 or more, you have to be very careful when make a facial expression. Since most fats in your body tend to go down through the gravity, there are barely fats on your facial area so it is easy to get lines. So try avoid forcing a smile or frowning. When you need to smile, just naturally laugh. Second, I can't get rid of wrinkles but I can keep it down. With maintaining good wrinkle care habits, you can also do facial exercise or massage. I am trying to do facial yoga and massage everyday. It would effects on retardation of wrinkle forming because you are actually stimulating lymph vessels during massaging or exercising. I wash my face with cold water. After using cleansing milk you should you use warm water in order to remove all the dirts completely. However, be aware of washing your face with cold water once more. Since warm or hot water evaporate quicker than cold water, it is also easy to take water away from your skin. As a result, your face dry up faster and get wrinkls easier. Also, pores on our skin prone to open and excret at high temperature, it would remain open when you wash your face with hot or warm water. So it is important that finish with cold water in order to close the pores. Aplying lotions or other skin care products right after washing your face is another key point that you don't get wrinkles easily. However, it is best way that you don't apply any product on your skin. Our body remebers what happens and try to balace. So if you keep applying too much of lotions, it would think your skin doesn't need hydration so it would stop generating. Thus, the best way keep moisturizing is appy adequate amount of skin product. Just skip apply lotions or toners and even ani-aging creams 2 or 3 times a week. I used to have very dry skin ever since I moved to NorCal, I put pretty large amount of lotions and toners everyday. However, for some reasons, my skin got drier and drier. I had even tried some medications but it didn't work. One day, when I studied for midterm and was reading text book (oh yeah, I was pre-med student), I realize that my skin went to wrong path. (The material I was studying was hormone) And few days later, I had a chance to watch Japanese TV show "嵐の宿題くん", rarely they deal with beauty subject but it was special broad cast that they have special guest to talk about this. I don't usually write much on the posts, but this is way too long.